Ahmad Al-Assir was living the Lebanese Dream. He headed a political and religious movement, with hundreds of followers behind his back. He used to spend most of his time with the (In)famous Fadel Shaker. Even if it wasn’t in one day *gasp*, he went Skiing and didn’t mind enjoying the sun at the beach. He shared ice-cream with the Kids, rode bicycles, made a tour around Lebanon from Arsal to Tripoli, and – why not – visited Faraya. Meet Sheikh Ahmad Al-Assir, Lebanon’s rising controversial cleric, who also had armed disciples patrolling with freedom in the streets of Abra. He called for Jihad, fought in Syria, warned Hezbollah, attacked the army, before finally running away from the mosque he was preaching from (and that was apparently closer to a military complex than to a praying place). Why. Just, why. Ahmad Al-Assir gave Hezbollah a deadline till Monday, but attacked the army on Sunday. Why would a rising Salafi cleric commit political suicide is a question that doesn’t have an answer and will probably never have. Maybe with time things will get clearer, but Ahmad Al-Assir knew that attacking the army would’ve been the end of his career. It was simply the wrong decision, at the wrong place, at the wrong time. A Bad Idea. You don’t attack the army when you don’t have people inside it who can calm things down. You don’t attack the army when there’s a 60000 men difference. And you don’t attack an army with no available political support. Had he attacked Hezbollah members, he would’ve got through with it using the alibi of avoiding the Sunni-Shia strife. But Al-Assir insisted on maximizing his enemies, for no relevant reason. A Bad Timing. There can’t be any worse moment. The commander-in-chief of the army wants to prove himself few months before the presidential elections, and the politicians are busy forming a consensual government after the quasi-unanimous extension of the parliament. In other terms, it’s the political honeymoon season in Lebanon: An attack on one side turns the entire country against you. And Al-Assir chose the easiest target that the Lebanese might unanimously support: The army. A Bad Place. 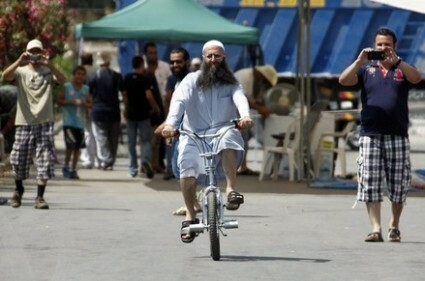 Saida isn’t exactly a heaven for Al-Assir. It’s a lot smaller than Tripoli and Beirut, was traditionally left-leaning, is surrounded by one of Lebanon’s biggest Shia regions, and has several Christian villages to its east. Al-Assir would’ve probably lasted more than two days in Tripoli, but in Saida, it was impossible for him to hold his headquarters for more than a couple of hours. Something was weird from the beginning. Ahmad Al-Assir is the grandson of Yussef Al-Assir, one of the few (if not the only) Muslim clerics that worked with the Protestant missionaries and translated the Bible to Arabic in the Nineteenth Century. His father was a folk singer, and if it’s not awkward enough, his mother is not even a Sunni, but a Shia. Why would anyone with such a background belong to – not mention lead, or even found – a Salafi group is a mystery. Not at all. Hariri used Al-Assir to make Mikati look as an unpopular and illegitimate Prime Minister among Sunnis. Mikati saw in Al-Assir a chance to start filling the Sunni void left by Hariri and piss him off. Hezbollah made use of the Salafi boogeyman to make the Shias feel safer within the party. For Berri and Jumblatt, he was one of the people responsible of the bad security situation, and whose actions gave an alibi to the extension of the parliament’s terms. For Michel Aoun, he was the takfiri that should make the Christians forget about the Wilayet Al-Faqih propaganda of 2009 and think instead of a scary Dawlat Al-Khilafa. For the Lebanese Forces and Kataeb, he was an annoyance to Hezbollah, and that was enough for them. A force d’être manipulé, on devient manipulateur. Assir kept on growing and growing and growing, until in a moment of complete political stupidity – when nobody needed him – he committed his mistake. Now that the current parliament is staying, that Jumblatt will still be the kingmaker and Berri will still be the speaker there is no need anymore for the annoying Assir – that is few Kilometers away from the Chouf and the South – to create instability. For Aoun, the Salafiphobia doesn’t lead anywhere with no elections. No need to fill any Sunni void anymore with Salam as a PM-Designate, and it is wiser for Mikati and Hariri to politically end any other possible rising Sunni. Hezbollah had enough with him, and the Lebanese Forces started viewing him as an ideological threat. It was only a matter of time before Al-Assir got hated by everyone: They gave him – via the media – the illusion that he was strong enough and he willingly created his own trap and fell into it. The parliament’s extension was left unnoticed with Saida’s violence. The commander of the army is now a potential candidate to the presidency. The rumor about Kahwagi’s threat to the president of resigning less than 9 Months (the constitutional deadline is 6 months) before the elections raises suspicions. So does the sudden urge to extend the mandate of Kahwagi on the head of the army that makes him not eligible to run and embarrasses him in case he would want to resign and become a candidate. You would hear a unpreceded unanimous support to the army. But beware, for a silent presidential electoral battle between three Generals (Aoun, Sleiman, Kahwaji) is starting. The battle of Saida is over. The Battle for Baabda has just begun. ← Does Lebanon Need The First Amendment? It always amazes me how people just think it possible that stupidity is not impossible and that random events might not be always typical serendipity. To be fair; it is easier.